The Schering Foundation has awarded the Ernst Schering Prize 2014 to Magdalena Götz, Professor of Physiological Genomics at LMU and Director of theInstitute for Stem Cell Research at the Helmholtz Center Munich. Professor Götz receives the Prize, which is worth 50,000 euros, for her ground-breaking work on the molecular mechanisms that underlie brain development. One of her primary research interests focuses on the function of stem cells in the generation of cell diversity in themammalian brain. Her seminal discovery that a specific class of glia cells act as neural stem cells generating also neurons resulted in a paradigm change in the neurosciences. These cells are now recognized as being of crucial importance for neurogenesis in both the developing and the adult brain. As such,they could provide the basis for novel therapeutic approaches to the treatment of brain injuries and neurodegenerative diseases. Magdalena Götz studied biology in Zürich and Tübingen, and obtained her doctorate in 1992 for research carried out in the Max Planck Society’s Friedrich Miescher Laboratory in Tübingen. She subsequently worked at the National Institute for Medical Research in London, and held posts withSmithKline Beecham in Harlow (UK) and at the Max Planck Institutes in Göttingen and Munich. In 2004, she became Director of the Institute for Stem Cell Research at the GSF, today’s Helmholtz Center Munich, and was appointed to the Chair of Physiological Genomics at LMU Munich. 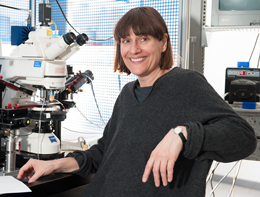 Professor Götz has received numerous honors for her contributions to neurobiology, including the German Research Society’s Gottfried Wilhelm Leibniz Prize in 2007. The Ernst Schering Prize, worth 50,000 euros, is one of the most prestigious science prizes in Germany.It was established by the Schering Research Foundation in 1991,and has been administered by the Schering Foundation since 2003. The accolade is awarded annually to individuals for outstanding achievements in basic research in the fields ofmedicine, biology and chemistry.The 2014 Prize will be formally presented at a ceremony to be held in the Berlin-Brandenburg Academy of Sciences in Berlin on 23.September 2014.